For those of you who survived the 1960’s folk Mass scene, some questions: did you ever wonder how “Kumbayah” became emblematic of people sitting around, holding hands? Or why Michael had to row the boat ashore when technology of the time had outboard motors (as depicted on the right)? Or why, with so much rich music from the black church, we always fell back on “Were You There”? This “folk Mass” (more about the quotes later) may be the answer to some of these questions; it is certainly a pioneering work in the genre. It originated in the San Francisco bay area, at St. Paul’s Episcopal Church in Burlingame. Frederick Gere was an Episcopal minister who had worked at the University of California at Berkeley during a very turbulent time. 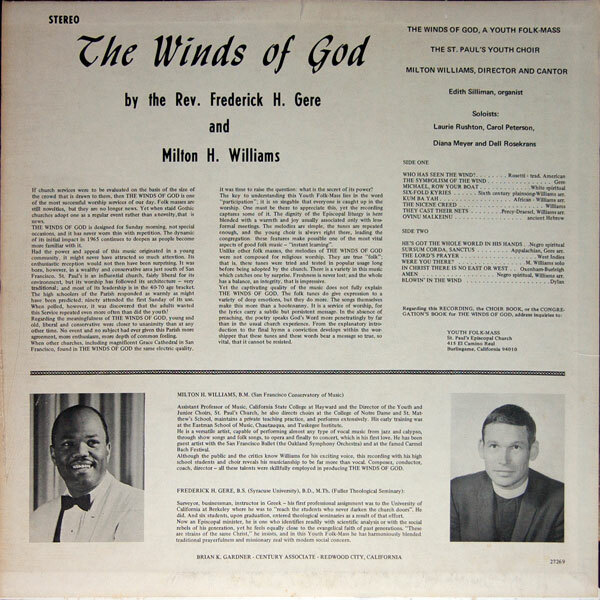 It became obvious to him (and many others) that, to reach the generation coming up, more contemporary sounding music was in order, and The Winds of God was his and Milton Williams’, a music professor at the California State College at Hayward, answer. “Contemporary” is a relative term, however; there are obviously many concessions to traditional Episcopal/Anglican hymnody, not the least of which is the presence of the pipe organ on many pieces. Given the early date of the album, they didn’t have much folk music to work from. The Mass proper is reasonable, and the rest of the work is cobbled together from black spirituals, one piece in Hebrew, the 1940 Hymnal (including my unfavourite hymn, “They Cast Their Nets”), pop songs such as “Blowin’ in the Wind” and of course “Kum Ba Yah”. In spite of the disparate origins of the music, the production comes off surprisingly well. That’s due to the professional quality of the music direction and the production, including Milton Williams’ excellent operatic voice. 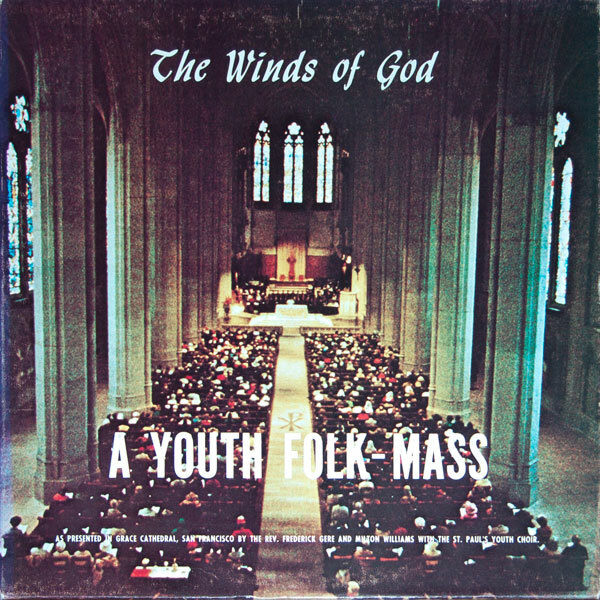 The album cover claims that this performance was at Grace Cathedral in San Francisco; the recording is better than most at minimising the echo that creeps into cathedral-type recordings. It’s clear that this work had a strong influence on many organists and choirmasters in the Episcopal Church as the 1960’s lurched along with crises detonated by the likes of Gere’s bishop, James Pike. One thing that the albums include is a narrative by Gere about what the folk Mass was all about. This is very much a product of the era, although, restricted to one track, it is much less intrusive than his fellow Episcopalian Ian Mitchell or Catholic Sister Germaine, who larded their works with music and explanation of most tracks. Unfortunately events were moving faster than Gere and Williams had either anticipated or were allowed to follow. Already Peter Scholtes‘ “Missa Bossa Nova” was pushing styles in a more folk/rock direction with his inner city musicians, and fellow Episcopalian Tom Belt would shortly break out of the “high church” mould entirely with God Unlimited. But this is a nice production that, for all of its conservatism and inconsistency, grows on you, as it did for many back in its day.